"At least three members of Volkswagen’s board said they were left in the dark about the company’s emissions cheating for two weeks after top executives admitted the deception to American environmental officials...If Mr. Winterkorn did not know about the communication with the American regulators, he was unaware of a fundamental threat to the company. If he was aware, he withheld significant information from members of his 20-member supervisory board...It was a 'grave mistake' for Volkswagen executives to withhold information as long as they did, Mr. Weil said on Friday in a statement. He noted that American regulators had raised red flags about Volkswagen emissions in 2014. 'Talks took place for a full year before Volkswagen admitted the deception,' Mr. Weil said. 'This confession should clearly have occurred much earlier'...Some outsiders expressed surprise that Mr. Winterkorn, known for his attention to detail, would have been unaware that E.P.A. officials had been asking for more than a year why Volkswagen diesel cars had far lower emissions in laboratory tests than on the road. 'I find it very improbable,' said Ferdinand Dudenhöffer, a professor at the University of Duisburg-Essen who follows Volkswagen closely. 'He was always the one who wanted to know everything'. Volkswagen initially contested findings by independent researchers and the E.P.A. in 2014 that showed big discrepancies between the pollutants that its cars generated on the road compared to lab tests. Then, on Aug. 21, 2015, at a conference in Pacific Grove, Calif., organized by the University of California, Davis, a Volkswagen official informally mentioned to a senior E.P.A. official that the company had been deceiving regulators. The revelation surprised the official, Christopher Grundler, who runs the agency’s Office of Transportation and Air Quality. Standing next to him at the time was a regulator with the California Air Resources Board, according to an E.P.A. official who confirmed the events, earlier reported by Reuters. In a Sept. 3 conference call with officials from the E.P.A. and the state of California, company executives detailed how Volkswagen vehicles were programmed to trick emissions-testing equipment. An E.P.A. spokeswoman declined to identify the Volkswagen officials who have been in talks with the agency." Comment: In the history of modern management I doubt that that there is a similar instance where a corporate 'official' has admitted to government officials that his company was willingly deceiving regulators in this manner without the presence of legal counsel..unless he was a whistleblower. If he is not the latter, he must be the most naive and 'stupid' individual that has ever worked for a corporation in such a capacity and there will be a special 'dark' place in the annals of corporate business history for this 'dumb ***'. In fact this case might require, from now on, any government official that hears such a 'confession' to read to the corporate employee that is babbling away his 'Miranda' rights and alert him/her that they has a right to remain silent & in the presence of legal counsel before he /she continues to 'talk' & make such self-incriminating admissions. The only sensible solution once VW realized the 'defeat device' deception could no longer be contained, or explained away, was to let their legal department & governmental affairs personnel handle the sensitive negotiations leading to their admission (at last resort) of some sort of 'wrong doing'. And negotiate a 'plea bargain' deal from the 'prosecutors'. The least intelligent and totally reckless behavior was to admit to both the EPA and CARB the 'fraud' in an informal at some 'academic' function involving a California university. Comment: It's too early in the investigation to 'clear' Winterkorn. You will see what I mean as the investigation continues & grows. Comment: Another visible & tangible proof that the German Government will not abandon VW to its 'fate' in the hands of US government & other foreign regulators. Angela Merkel's appearance with Matthias Mueller is not without significance. See WSJ article above re: increasing German government involvement in the 'problem' with US authorities! Comment: Other European auto manufacturers making diesel-engined models might have been doing the same thing as VW to 'rig' their diesel emissions too. The task now is how that information will surface in the press and the implications for the other auto manufacturers with regulators here & abroad. 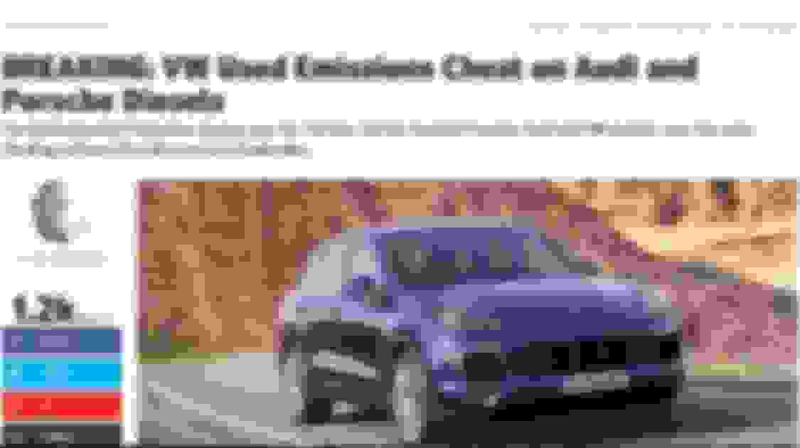 ''The Volkswagen emissions scandal was uncovered only because researchers could not afford to test more expensive cars, The Mail on Sunday can reveal. The American engineers who discovered that Volkswagen used a ‘cheat device’ to pass emissions tests said they originally wanted to test Mercedes and BMW vehicles, but the cars were too pricey to rent. Instead, they used a VW Passat and a VW Jetta saloon – without knowing the cars were fitted with the device to help them pass emissions standards. A BMW X5 sport utility vehicle was also used. The testers spent a month driving the three cars around California with specialist monitoring equipment. The results showed the two VW models would pump out as much as 40 times the allowed levels of nitrogen oxide. When this was later corroborated by the US Environmental Protection Agency and California Air Resources Board, it sent the German car firm into near meltdown. Daniel Carder, who led the testing team from the Centre for Alternative Fuels, Engines and Emissions at West Virginia University, said: ‘We didn’t set out to trap Volkswagen – it was just that we could spend less money on using their cars.’ More than 11 million cars are being recalled worldwide, with 1.2 million of those in the UK. VW, which yesterday said it had been forced to drop the Royal Warrant from its communications in the wake of the scandal, has set aside £4.7 billion to deal with the fallout from the scandal, but analysts at Credit Suisse say it could cost it closer to £56 billion. Meanwhile, a survey found that public trust in the car industry has been badly damaged, with nearly eight in 10 people now saying they expect more manufacturers to be drawn in to the scandal'. Comment: To survive, VW will have to prove that it was not the only one rigging the emissions on its diesel engines. Slowly it's coming out that other diesel car manufacturers were/are suspect...it's just that VW were the cheapest cars the investigators could afford to purchase for testing. That lid has now been blown on 'diesel gate' ...and everybody & everything claimed that is diesel-related will be suspect & tested. And that is what might save VW in the end...and why the German gov't might have to come to the rescue by telling the US & other regulators that the problem is universal to the European (and perhaps the ROW) diesel industry and they (the regulators) can't make VW an scapegoat (nor a sacrificial lamb) because it could destabilize the entire German & European economic (and thus political) system due to the importance of the auto industry to the EU. Follow this other thread too: "More Information on the Resignation of Ferdinand Piëch from the VW Supervisory Board!" I posted this in my other thread, but thought it worth posting here as well. Received word from Porsche Exclusive that only 22 Spyders were approved for PTS in the U.S. market!!! So if you managed to snag one, count yourself lucky!!! I count my self pi$$ed and not quite as poor as I would have been. I was first in-line at my Dealership and had already agreed to a PTS Spyder. But with no PDK, no Spyder, which was no problem to the Dealership. Porsche lost a sale from me because my 2013 PTS Boxster is holding up quite fine after 16K miles, 12 Track days and no problems. I just got a GT4 allocation for March build. My SA submitted my order yesterday which includes the LWB seats. I think the Paint to sample box was available, I've sent Melissa at Porsche Exclusives msg to see if its possible. Does the SA have to do something to followup on this for me? Visit Dave C4S Cab's homepage! Sorry to be the guy that breaks it to you, but your order will be more than likely rejected. The LWB stop order is still in affect. Just because the system initially accepts it, doesn't mean Porsche AG will. PTS is also closed. I was prepared for that and it's not a deal breaker for me. I was just on the phone with my SA and he sent me this screen shot. Where would it show if LWB were rejected? It looks like my car is scheduled for Feb prod rather than March. My guess is that your GT4 was v200 prior to adding the seats. My guess is you will go back to v100 once Porsche AG sees your order change. There is a delay due to the time difference. There is a huge thread in the GT4 area around this exact topic and a lot of angry people due to the stop order. Actually the LWB were on the order when 1st submitted and the screen print is the most current status. Does that mean as of now they don't have a problem with my order. I've been following the LWB thread. The seats are a nice to have for me but not a deal breaker, fingers crossed. I'm just happy to have gotten this allocation @MSRP. 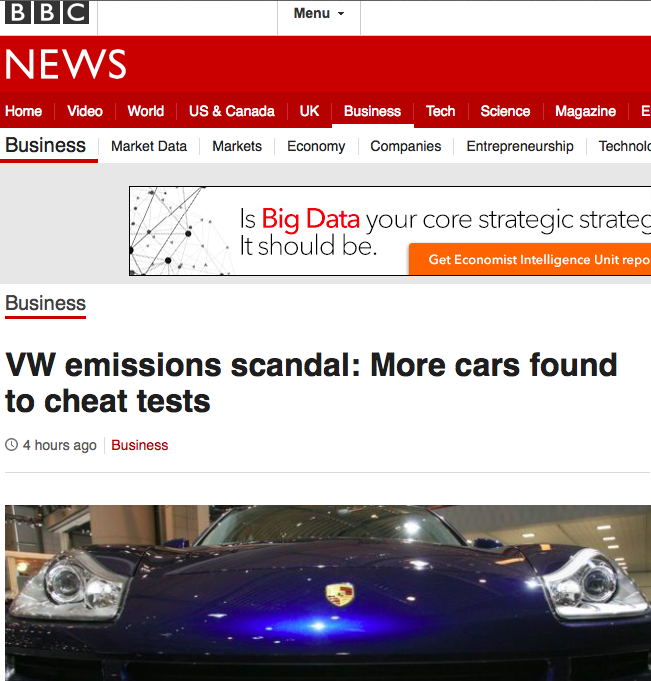 Meanwhile, Volkswagen is denying that it used cheat software in its 3.0-liter TDI engines. said in a statement released today in response to the EPA’s allegations. in an earlier post about the VW official that admitted to the EPA & CARB that they were cheating. trying to tank the value of the stock & profit from it? finds itself in the same tough bind as VW did over 'Dieselgate'! umm back to the seats...I hope/think Porsche will work something out with the supplier so that we can all have LWBs. It's not a deal breaker for me, but I wanted something in the interior that separated the Spyder from the GTS, other than the logo. I was talking with my salesman yesterday about the build on my new CGTS and in passing he mentioned that another customer awaiting his GT4 was hoping for the LWB's and Porsche confirmed to him(salesman) that they would NOT be forthcoming for the rest of the 2016 model year. For whatever reason (supplier related I'm assuming) they are officially unobtainable. A shame. Eduardo, I just noticed your post in the GT4 forum. "This thread's purpose is to shed some light into the sometimes opaque world of 'Porsche Exclusive'. with PAG, PCNA or any dealer, so all of this is being done is the spirit of 'Liebe Zu Ihm'." This one, which is not even a 'Sticky', has over 110K views! received & answered regarding PTS & 'Porsche Exclusive' options via Rennlist! So it's hard to make the case that we have not moved the needle on PTS! We have made a big impact. out-of-the-ordinary colors available to them via this option on their custom Porsches. Any idea on the motivation behind this policy? When was this change conveyed to you? large print 'For Internal Use Only - Confidential' in early September. my direct contacts at PCNA & PAG, to reverse that policy which categorized the PTS list as 'Confidential'. success. And I am quietly trying them to reverse course. Please let us know what you think this means for the future of how PTS will operate. Not good if they stubbornly stick to their guns and keep the approved PTS list confidential from now on. PTS & 'Porsche Exclusive', that has indeed put me on a difficult spot. and them open and transparent. Let's hope they choose the former...but ultimately it's their company & they will run it as they see fit.